This document has been re-typed from an aged typed version of unknown origin. The aged version was transcribed from copy that is assumed written by James Harrison. James Harrison was the first son of Robert Brown and Rebecca Douglass Gageby, born September 5, 1835. He passed at home in Johnstown, PA, on July 13, 1896 at 0520 hours of unknown causes. 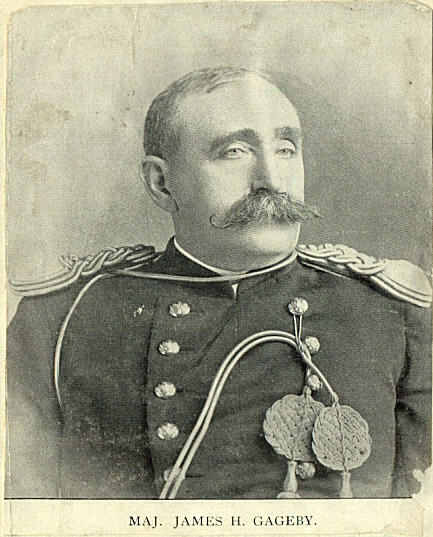 Major James H. Gageby, 12th Infantry, U.S.A. I was born in Johnstown, Pa. Am of Scotch Irish descent. I entered the military service April 19, 1861, as a Sergeant Co. K, 3rd Pa. Vols. "three months service," the company was known as the "Johnstown Zouaves" and as such was thoroughly drilled in Infantry tactics. I served with the 3rd Pa. Vols. In General Patterson's Column in Maryland and Virginia, was engaged in the battle of Falling Water, Va. July 2, 1861, was discharged July 30, 1861. I assisted to recruit a company for the 76th Pa. Vols. With a view of becoming a commissioned officer in that regiment, but prior to the organization of it I enlisted in the 19th U.S. Infantry, October 25,1861, and was appointed a 1st Sergeant to date from enlistment; was on duty in Greensburg, Penn. Several weeks drilling a detachment of the 19th Infantry, and at the Headquarters 19th Infantry, Indianapolis, Ind. was engaged as drill Sergeant until the organization of the Co.'s G, and H, of the 1st Batt. 19th Infantry, when I went into the field in the "Army of the Potomac" as 1st Sergeant of Co. G, and served with it at Harrison's Landing at Headquarters Guard for General McClellan from there and in the campaign through Maryland, at the battle of Antietam, South Mountain and subsequently at the battle of Fredericksburg, at which time we were attached to the 17th Infantry, we were actively engaged during all the battle. In March of 1863, Co. G, was transferred to the Army of the Cumberland, joined the 1st Batt. 19th Infantry, at Murfrees boro, Tenn. I was appointed a 2nd Lieut. June 1, 1863, and assigned to Co. A, 19th Infantry; served with it until the battle of Hoover's Gap, Tenn. When I was placed in command of Co. G, 19th Infantry, and led it in the charge of the Regular Brigade against the Division of the Confederate for which I was brevetted 1st Lieut. For " Gallant and Meritorious Service in action at Hoover's Gap, Tenn."
I was returned to Co. A, 1st Batt. 19th Infantry, just prior to the battle of Chickamuaga, Ga. I was wounded and made a prisoner of war on the 2nd day of the battle (Sept. 20, 1863), was taken to Libby Prison, Richmond, Va.
During the construction of the famous tunnel Captain E. L. Smith, Lieut. M. C. Causten and myself were told by Colonel Rose, Chief of the tunnel party, to consider ourselves as belonging to his party and while we were not permitted to work in the tunnel, on account of the prejudice of some of the Volunteer Officers, we were charged with preventing the discovery of the tunnel while it was being constructed. I escaped through the tunnel February 9, 1864; was recaptured Feb. 11, near Charles City X Roads, Va. And returned to Libby Prison, placed in the middle dungeon during eight days, was removed to Danville, VA., Charlotte, N.C. and Raliegh, N.C., March 1st, 1865, after as imprisonment for seventeen months and ten days, returned to duty as 1st Lieutenant 19th Infantry, on Lookout Mountain, Tenn. in May 1865. I was on duty with the 19th Infantry, in Arkansas, and the Cherokee Nation in 1865 and 1866, was brevetted Captain Nov. 25, 1864; this was as official clerical error of the brevet board and should read September 20, 1863, as I am credibly, although unofficially informed. I was ordered on recruiting service in September 1866 until March 1868; was appointed a Captain in the 37th Infantry, and passed my examination for that office in Louisville, Ky. I joined the 37th Inf. At Fort Stanton, New Mexico in March 1868; was engaged in several unimportant scouts and expeditions against the Mescalaro Apaches and in October 1868, I was ordered with my company I, 37th Infantry, to join the Canadian River expedition under Col. A. W. Evans, at Fort Bascom, against the "Comanches," we were out four months, a greater part of the time without tents, until we found the Comanche Village on the Salt Fork of the Red River, Texas, Dec. 25, 1868, where we actively engaged with these Indians from 10 o'clock A. M. until sundown of that day. In April and May, 1869, I was with General J. R. Brooke on his expedition against the Mescalaro, and the Sierra Diablo Apache Indians. My company had a brief engagement with them, near the big Canon of the Guadolupe mountains, New Mexico. I was assigned to the 3rd Infantry, August 11, 1869 and with my Co. D, was on duty in 1870 guarding the Kansas Pacific Railway in Colorado, where we had several slight skirmishes with Arapahoe and Chyenne Indians, was removed to Fort Lyon, Colorado, and Camp Supply, I. T., and in 1874 was ordered on reconstruction duty in the South and remained there until August 1877, when I was ordered North during the riots in Penna., Ohio and Indiana. In September 1877, was ordered to Fort Missoula, Montana, where I served until again ordered on recruiting service in 1878. I rejoined the 3rd Infantry from recruiting service in May 1881; served with it until April 1883, when I left on sick leave and remained absent from my regiment until May 1885, was on duty with my company until February 1889 when I came on leave, was at my home in Johnstown, Pa., at the time of the flood, where I lost several members of my family and all my home property; was placed on duty there by order of the Honorable Secretary of War and performed duty with the Penna. National Guard until September, 1889, when I was detailed on special recruiting duty for one year, and subsequently selected by Colonel Mason of the 3rd Infantry, for the regular detail, was on that duty until promoted to Major 12th Infantry, July 4, 1892. Am stationed at and in command of Fort Sully, South Dakota. The following is a letter James wrote to his parents while on duty in the Civil War. I received your letters & postage stamps. I was very glad to hear from home. I had a letter from George this week. He is well and sent me 25 stamps. I will not suffer for stamps soon, again. I am well & hope this may find you the same. I have been on duty every since I wrote to you last. I suppose you have seen, ere (Sp?) this, the acct. of the Rebs shelling us at this place. None of them dropped on our camp. A great many of the rifled cannon shot passed very close to us. The shells that were intended for us went over us. The camp next to us was riddled. There was a nice little fight at Malvern Hill, yesterday. I heard the cannonading commence about 31/2 in the morning & they kept it up nearly all day. The Rebs were drove from their fortifications with considerable loss. A great many prisoners came in last night, or rather, they were brought in by our men. Our hoosegow is full of gray jackets today. They are mighty fine looking men. I don't know how many was killed or wounded as we never find out the result of a fight until we get the Philadelphia Inquirer, which is about 3 days later. It takes the news about 21/2 days to get to Philadelphia and back to us. Can't you send the Johnstown paper to me every week. It is very little trouble to you to pay a cent & send it every Friday evening & if you knew what good it does me to get one of them little papers I know you would send one regular. I walk 4 miles every Sunday to get sight of one. Tell Charlie Gathagen that I see Dave Moose nearly every day. He is well. I see Harry Kern & Fred Workman every week once or twice. Don't forget to send the paper. Write soon. Give my love to all. Comp G 19th U.S. Inft. The following is a letter James wrote to his sister, believed to be Mary, while on duty in the Civil War. Your kind letter came to hand a few days ago. I was very glad to hear of old Johnstown coming off safe. The Rebs were driven out of Perma (Sp?) with great loss on both sides. How do the Copperheads relish the joke. I suppose they are not so loud, lately. I have talked to several Irish (Sp?) widows lately and they say that they could put on the trousers and drive the Yankees out of their land if necessary. Now what is to hinder you from doing the same thing with the Copperheads. What do you say to that. We are under marching orders and expect to move soon, perhaps tomorrow. Look out for good news. I am well. Write soon. Please send me some stamps. I received your paper that you sent. Send more. Tell George that I received his money, 50 dollars. Give him my address. My love to Mother, Father, and all. It is very hot here. We have plenty of green corn and all kinds of vegetables. Come and take dinner with me on my birthday (3rd of September). I would like to be home for a few days but leaves of absence are out of the question. Maybe I will get wounded slightly in the next fight and then I can get a leave. I hope I will never get a leave in that way. At least I don't covet it. The following is a letter James wrote to his brother George while a prisoner of war in Richmond's Libby Prison. 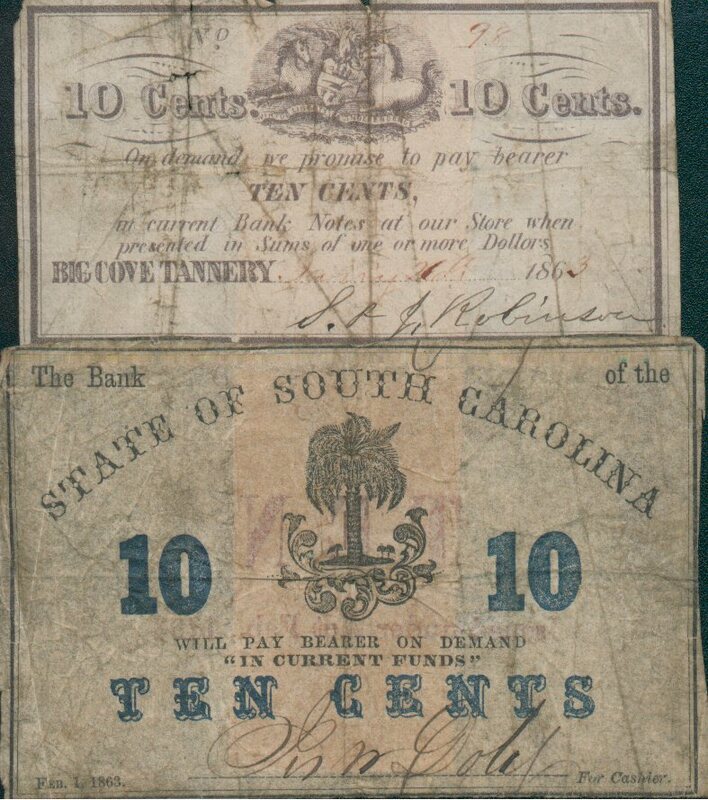 Confederate money found on the battlefield at New Hope or Peidmount, Va, June 5, 1864.